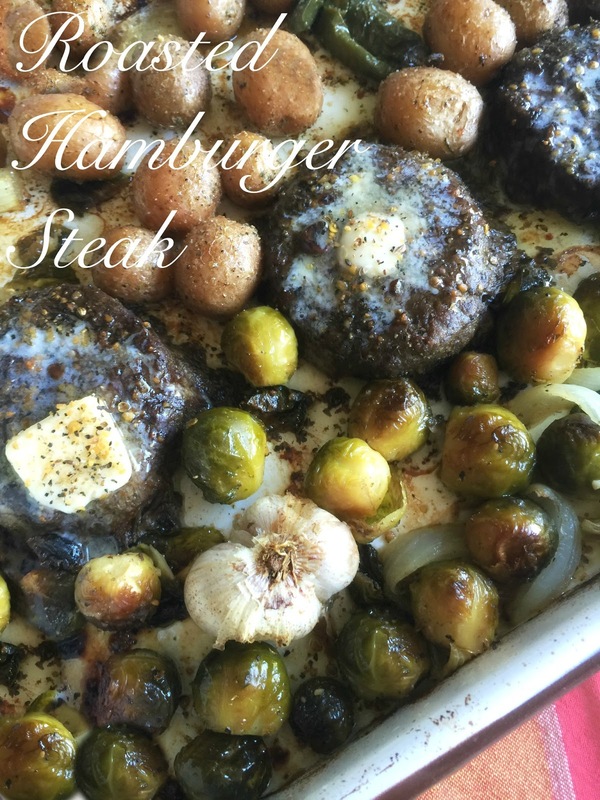 Roasted Hamburger Steak, lean ground beef seasoned with simple seasonings roasted in a sheet pan with whole garlic bulbs, and vegetables. The final touches bring this meal to a whole new level, melted butter; roasted garlic smeared on top--oh! my. 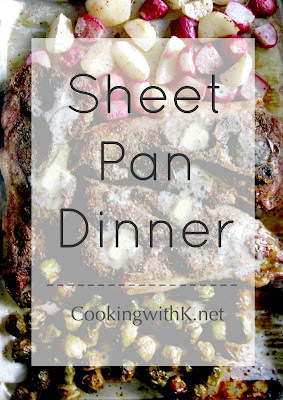 Sheet pan dinners have become a favorite around our house lately. 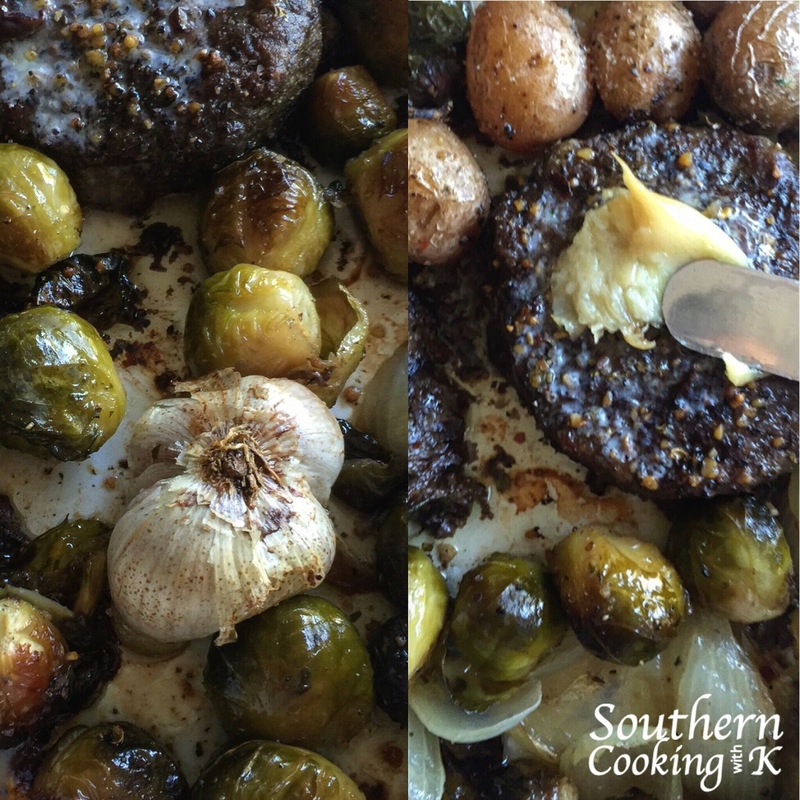 We love the ease of preparation and clean up, consisting of cooking the entire meal in a sheet pan. I like to arrange the vegetables along the outside of the pan. While I like the meat down the center of the pan, this just means the juices flow to the outside of the pan and mingle with the vegetables. For the finishing touch to my sheet pan dinners, I like to add a pat of butter on the top of each piece of meat while it is resting to serve. Don't cut immediately into the meat. Let it rest so all the juices will stay in the meat and not run out. To add a special touch, this time, I smeared two or three pods of roasted garlic on the top of each hamburger steak along with the butter. 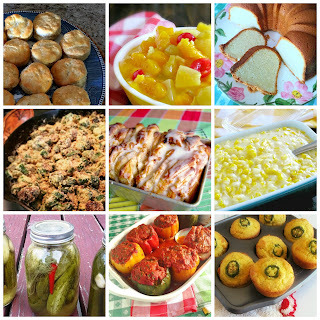 There are so many adjustments you can make in this recipe to your liking. If you like your meat cooked longer, and the vegetables are ready, just remove the vegetables and return the meat to the oven and finish off with the butter and roasted garlic then. I already have another sheet pan dinner recipe planned for this next weekend. I hope you get to make one soon. Enjoy! Preheat oven 425 degrees F. In a small bowl, add salt, pepper, coriander, and onion powder and toss together; set aside. In a large bowl, add hamburger, and half of the seasoning mixture above. Mix all together well. 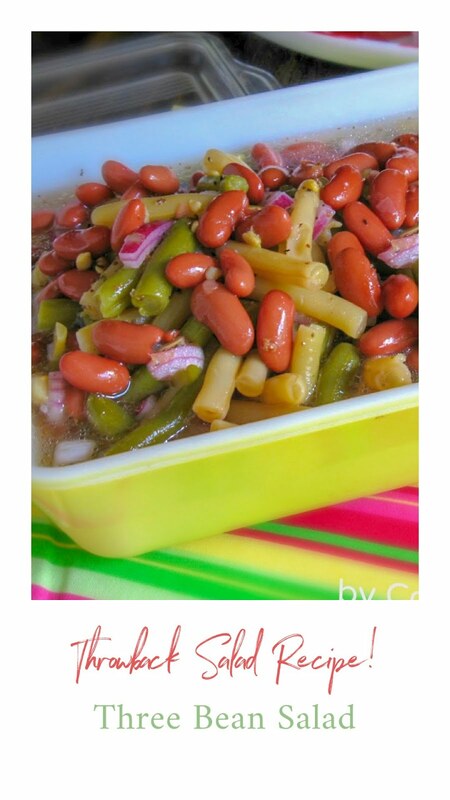 Divide mixture into 4 serving. Make each serving into steaks 1 1/2" thick. Arrange hamburger steaks down the center of a sheet pan and drizzle with olive oil; set aside. 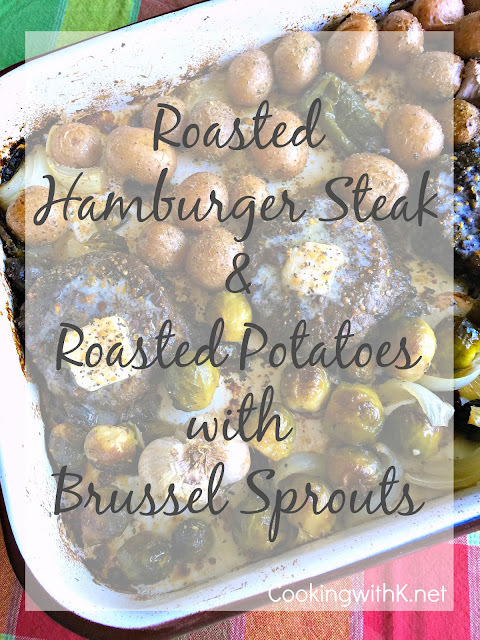 In a large bowl, add jalapenos, new potatoes, and brussel sprouts. Add remainder of the olive oil. Sprinkle the remainder of the seasoning over the vegetables. Toss vegetables making sure they are well coated. Arrange potatoes and brussel sprouts along each side of the hamburger patties. Nudge whole garlic bulbs, cut side down in between the vegetables; drizzle with olive oil. 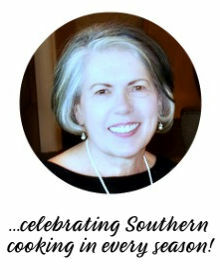 Do the same with the jalapenos. Place the sheet pan in the oven and roast for 30 minutes. Remove pan from the oven and turn/toss the vegetables to cook evenly. Place back in the oven and roast 15 minutes. Remove sheet pan. 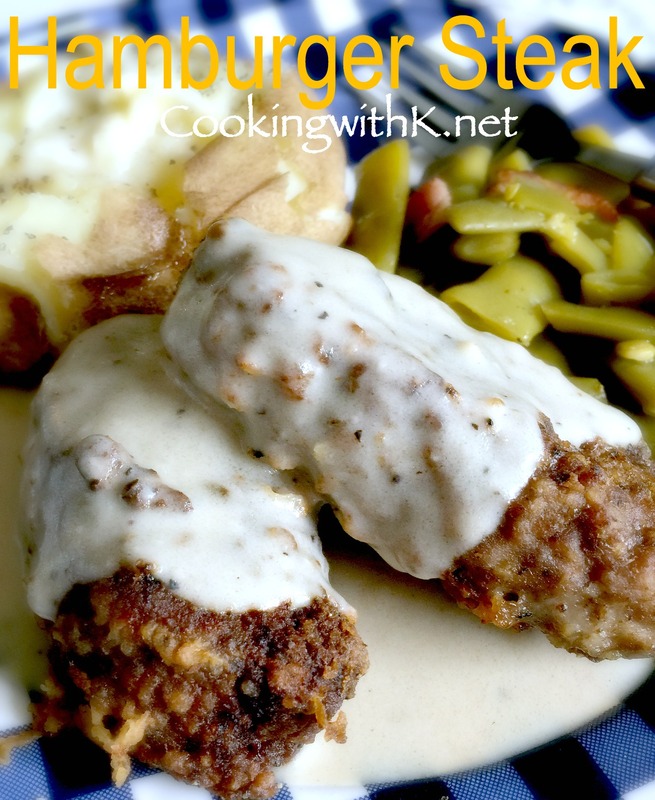 Place a tablespoon of butter on each hamburger steak. Remove the garlic bulbs and gently squeeze the garlic pods from the bulb. 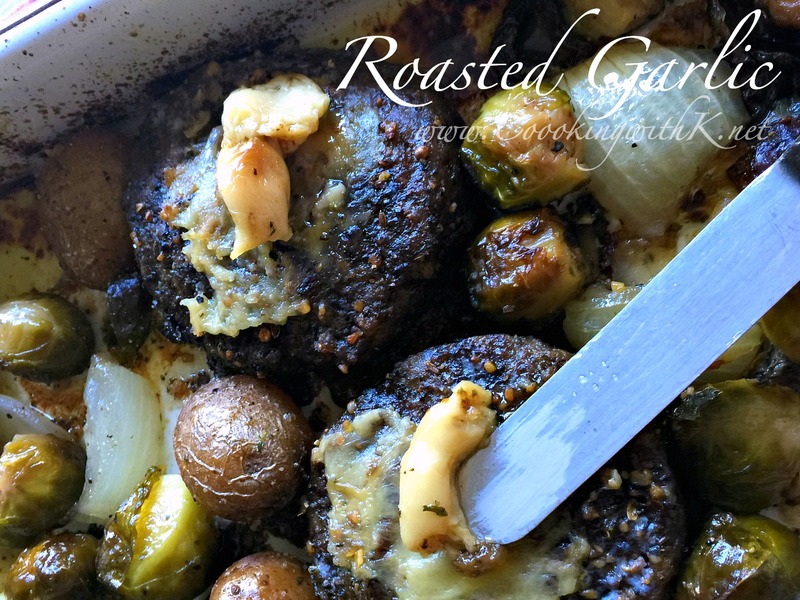 Just before serving, smear two or three pods of roasted garlic on each hamburger steak. 4 lbs hamburger meat! That's a lot of meat for only 4 servings! Sorry for the confusion. I made the correction. Is the 4 Lbs of meat really for 4 servings? Or did I miss something? Sorry for the confusion...I made the correction. Thank you Rocquie for stopping by to let me know your family enjoyed the dinner. Yes, the butter and garlic is where all the magic begins...haha! Welcome to CWK! I love sheet pan suppers, and this one looks fantastic! I can almost taste it!